Whisk together the coconut milk, vanilla and 2 tbsp of the agave nectar/syrup until smooth and creamy. Set aside. In a separate mixing bowl, stir together the blood orange juice and the remaining agave, until combined. Add more agave, to taste, as necessary. 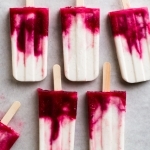 For a creamy pop: Stir together the coconut milk and blood orange juice, and divide evenly between the popsicle molds. Freeze for 30 minutes, then insert the popsicle sticks and continue freezing for 4 hours, or until firm. For a layered pop: Pour the coconut milk into the popsicle mold, divided evenly between the popsicle molds. Place in the freezer for 10 minutes, then top with the blood orange juice. Freeze again for 30 minutes, then insert the popsicle sticks and continue freezing for 4 hours, or until firm. Substitute any kind of citrus juice for the blood orange juice, adjusting the sweetness level as necessary. Remember, the sweetness will mellow once frozen. You can substitute granulated sugar for the agave syrup, if you prefer. I haven’t tried it, but honey would also be a good substitute, although it may add a different flavor to the pops. Agave syrup/nectar is up to 40% sweeter than granular sugar, so increase the amount of sugar accordingly if you go that route. I choose to use full-fat coconut milk in this (and most) frozen coconut recipes because it results in a creamier frozen texture that more closely mimics dairy cream. You can certainly use a lower fat-content coconut milk, but it will result in an “icier” textured pop. To remove the popsicles, either let them sit out for 5-10 minutes until soft enough to pull out, or submerge the bottom of the popsicle mold (up to the edge of the top) in room-temperature water for 10-15 seconds, then gently pull to release.